The Department of Housing and Urban Development spent more than $31,000 on a new table and chairs for the dining room adjacent to Secretary Ben Carson‘s office — revelations that came just months after an official that warned against high expenses was moved to a new role within the department. The former senior HUD official, Helen Foster, has since filed a complaint that she was demoted in retaliation for raising concerns about granting extra funds to redecorate Carson’s office and other issues within the department. “Its a real shame that an agency that is supposed to be looking after the poorest of the poor are more interested in looking after what their office looks like,” Foster told ABC News in an interview. 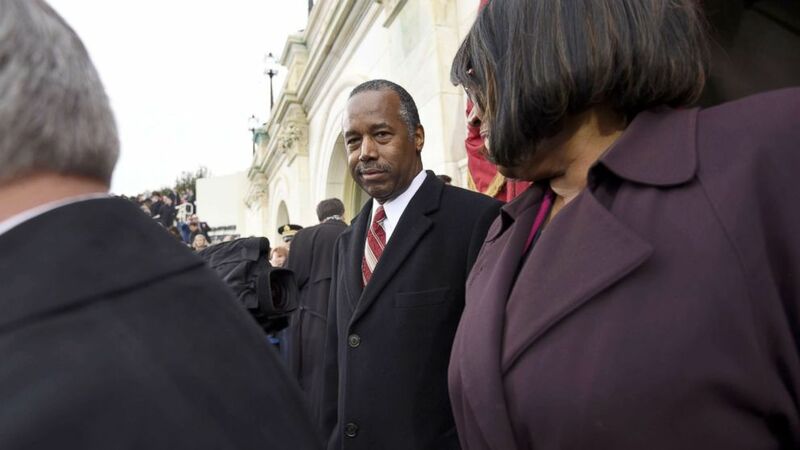 The day before President Donald Trump was sworn into office then-Acting HUD Secretary Craig Clemmensen allegedly told Foster to help then nominee Ben Carson’s wife, Candy Carson, redecorate the secretary’s office at HUD. When Foster responded that legally there was a $5,000 limit Clemmensen responded that the “Administration has always found ways around that in the past,” according to the complaint. Federal law requires officials to notify the House and Senate Appropriations committees about any furniture or decorating expense higher than $5,000, according to an internal HUD memo Foster provided to ABC News. The memo also says that the rule applies to the “entire suite of offices” and any other space used by the individual. A HUD spokesman said the agency wouldn’t comment on specific allegations in the complaint but said the HUD did not spend more than $5,000 to redecorate Carson’s office. HUD’s communications director Raffi Williams said that the secretary brought furniture the agency had in storage into his office so there was no additional expense and that they tried and failed to repair the dining set, which had been in the office since 1967. Documents provided to ABC News by HUD show that the agency spent $1,100 to try to repair the chairs in the dining set before buying the more costly replacement dining set. The agency also spent about $3,400 to buy new blinds for Carson’s office. A photo in documents provided by HUD to ABC News shows the table and chairs in a dining room adjacent to Sec. Ben Carson’s office. Foster says in her complaint that she received paperwork that she was officially reassigned to the position of Chief FOIA officer on October 24. On December 21 the Office of the Chief Administrative Officer placed a $31,561 order for the furniture, according to documents provided to ABC News by HUD. The agency says the table expenditure has no connection to Foster’s move to a new role and added the decision to buy the table was made by career staff. In Foster’s complaint, filed with the Office of Special Counsel in November, her lawyer wrote that she was unfairly reassigned to “lesser duties” as the department’s chief Freedom of Information Act Officer and was forced to report to a political appointee who took over her position after refusing to approve extra spending and bringing attention to a budget shortfall that others wanted to cover up. “I was just moved aside for no other reason than the fact that I did my job,” Foster said, adding that she is concerned that by moving her aside they were making it easier to misuse taxpayer money. Her attorney Joseph Kaplan provided a copy of the complaint to ABC News. Foster said she was recruited to HUD in 2016 by her former boss from the Treasury Department, who was a political appointee and left when the new administration took over. As chief administrative officer she oversaw the day to day operations of the agency outside of policy decisions. Foster said she had no issues before the transition to the Trump administration. Clemmensen is now listed as director of a department that “focuses on assuring the highest standards of ethics, management and accountability in the resolution of HUD’s troubled properties,” according to the website. He did not respond to a request for comment on Tuesday. The Office of Special Counsel investigates whistleblower complaints and wrongdoing within the federal government and is separate from the Justice Department special counsel in charge of the investigation into Russian meddling in the election, Robert Mueller. Carson was sworn in as HUD secretary on March 2, 2017. He has previously come under fire for comments like saying that the government shouldn’t make public housing “too comfortable,” which The New York Times reported he said on a tour of public housing in Ohio in May. Ben Carson is sworn in as U.S. Secretary of Housing and Urban Development by Vice President Mike Pence (R) as his wife Candy Carson and granddaughter Tesora Carson watch during a ceremony, March 2, 2017. in Washington, D.C.
His agency’s inspector general is looking into questions about Carson’s son, Ben Carson Jr, after he was included in a listening tour of Baltimore despite concerns from agency attorneys. The Trump administration’s proposed budget recommends an 18 percent decrease in funding for HUD, including a decrease in funds intended to help low income individuals pay their rent. The department’s proposed budget seeks a 1 percent increase in funding. Foster’s complaint lists other issues that reportedly happened around the same time as the dispute over decorating funds. It says that in February, Foster alerted Clemmensen that more than $10 million from the 2016 budget was mismanaged by the person previously in her position. She said that the budget shortfall would have to be explained to the congressional appropriations committees. Foster reported the issue to several other officials but was told a few months later that “agency leadership is unwilling to report the $10.8 million funding deficit to Appropriations Staff,” according to the complaint. Foster’s complaint says that that same month Clemmensen asked her to find two Freedom of Information Act requests seeking information about a HUD appointee and submitted by the Democratic National Committee. After she sent him the requests she alleges she was told by an attorney in the ethics department of the Office of General Counsel to handle the FOIA requests “discreetly” outside the normal FOIA process. The complaint says Foster was told that decision was made by Maren Kasper, the head of the Trump transition team to the department and White House adviser to HUD. ABC News has reached out to the White House and to Kasper for response. According to the complaint, Foster was eventually permitted to handle the FOIA requests but reported the issue to the department’s inspector general, saying that she was concerned duties of her job were being taken away because of her perceived party affiliation. She said the inspector general’s office confirmed the basis of her complaint but did not open an investigation. The HUD inspector general’s office said they would not confirm or deny any complaints from Foster. Williams, HUD’s communications director, would not comment on the allegations in the complaint. HUD also noted that Foster was not fired and is still classified as a senior executive service employee. The agency said it’s not unusual for such employees to rotate into different roles. Foster says there was another incident not included in the complaint in which she said that she was asked to justify paying for a security system at Carson’s house in Virginia using taxpayer funds. Career staff had recommended that the secretary install an alarm system at his home but a HUD memo provided to ABC News said that taxpayer funds could only be used for personal security if an official was threatened or in danger, or unable to do their job. Foster said she couldn’t justify the expense but didn’t include it in her complaint because the Carsons’ decided to pay for the security system themselves. HUD confirmed that the couple made the purchase. The complaint says that Foster had received positive evaluations since she started working at HUD in July 2016 and that the only reason to remove her from her position as chief administrative officer was the issues she raised about spending and that she is being retaliated against as a whistleblower. Foster says she has been “desperately” looking for a new job since the issues began but said “her reputation is ruined” and that every interviewer asks why she was removed from her original role so quickly. Foster is asking for back pay and damages to reimburse her attorney’s fees, for all files related to her reassignment to be expunged and for a public apology from the department.